John Levi was the first Australian to be ordained as a rabbi and to return to work in the land of his birth. He was named Rabbi Emeritus of Temple Beth Israel in Melbourne in 1997, served as Senior Rabbi of the Victorian Union for Progressive Union from 1974, and was elected Vice President of the Executive Council of Australian Jewry in 2005. He is a Patron of the Council of Christian and Jews, an organisation he helped to found in 1963, and a member of the governing body of the World Union for Progressive Judaism, 1974 to 1998. Rabbi Levi was one of the founders of Melbourne's King David School. 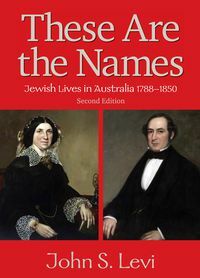 His publications include Australian Genesis (1974), The Forefathers (1976), Rabbi Jacob Danglow: Uncrowned Monarch of Australian Jewry (1995), The Musical Tradition of the Berlin Reform Synagogue (1998) and A Passover Haggadah (2002). He is a Member of the Order of Australia. Monash University awarded Rabbi Levi the degree of Doctor of Laws (honoris causa) for his contribution to the community and to Australian Jewish history in 2006.